In his book on Patty Hearst @JeffreyToobin writes she is only person to win commutation fr 1 prez, pardon from another. Indeed, page 387 of the work informs readers such a thing had never happened before, in American history ! It is no wonder LA. Weekly calls the book "spell-binding." The Washington Post goes further, saying Toobin's book is "an intelligent page-turner." The San Francisco Chronicle calls it a "book for the expert." It would be fun to have some insight as to how Toobin came to this conclusion, but the statement does not feature a footnote ... and with good reason ... because it could not be more wrong. We are not certain Toobin could have found anyone else in the universe who would write such a ridiculous statement. And, had Toobin done so, it would have only established one thing: there is at least one other person as clueless about pardons as Jeffrey Toobin. Throughout American history, presidents have frequently commuted death sentences and, later, their successors have granted pardons to the individuals who were spared. Those quite notable examples stand out in our mind immediately. But many more individuals have received commutations for less serious offenses and were later pardoned by another president. We would guess - with an extremely high level of confidence - more than 100, easily. Very easily. Roosevelt commuted the sentence. Taft granted the pardon. It took us all of 17 seconds to find this, which is just about exactly what we expected given our knowledge of the topic. Been done many, many times before. Arkansas' "Hanging" Judge Isaac Parker, for example, was almost a machine at creating these scenarios. Here (below), in 1902, Theodore Roosevelt pardoned a man whose Parker delivered death sentence was commuted by Benjamin Harrison, in 1889. Actually, on June 19, 1923, Warren Harding pardoned two persons who received commutations of sentence from previous presidents. Robert Boutwell of Texas, whose death sentence was commuted by Grover Cleveland in 1896, and Joe Trumble, whose sentence was commuted by President Wilson, in 1920. See Trumble's clemency warrant below (on the left). On October 6, 1917, one Walter Phillips was sentenced to six years at Leavenworth. On July 17, 1920, President Wilson commuted the sentence to four years. Phillips was released on parole January 21, 1921. On December 23, 1921, President Harding commuted the sentence to expire on Christmas Day. Phillips was thus no longer considered to be “in custody.” In 1925, President Coolidge concluded that Phillips “had conducted himself as a good citizen” and restored his civil rights with a pardon. Three acts of clemency for one guy, from three different presidents. Spell-binding. More famously (or, if you will, Hearst-like), there is a big building in Minneapolis, Minnesota with the name FOSHAY on the top. It was named for utility tycoon Wilbur Foshay whose 15-year prison sentence was commuted to 5 years by Franklin Roosevelt on January 23, 1937. Mr. Foshay received a presidential pardon from Harry Truman on March 26, 1951. Wild west outlaw, motion picture star, Oklahoma gubernatorial candidate and supposed prison mate/ friend of American writer O Henry, Al Jennings had his life- and six-year prison sentences (for assault with intent to kill and mail robbery) commuted by President William McKinley on June 23, 1900. 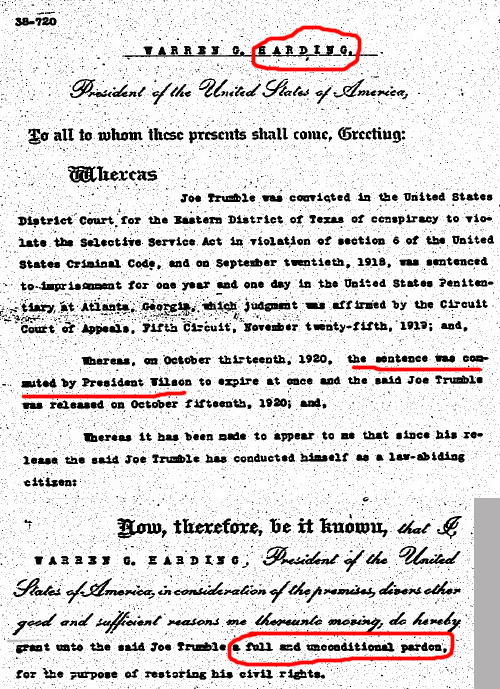 He was then pardoned by President Theodore Roosevelt on February 7, 1907. William Howard Taft granted two commutations of sentence to W. S. Harlan - the nephew of a U.S. Supreme Court justice (on February 24 and June 21, 1911). Harlan was then pardoned by Woodrow Wilson on September 8, 1913. 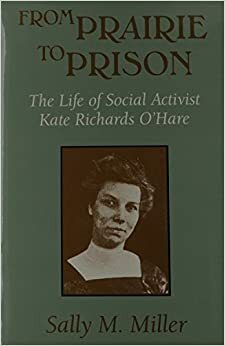 Kate Richards O'Hare was the first “important” figure to be indicted under the Espionage Act. O’Hare’s fame and popularity as a socialist speaker increased to the point that she was considered second only to Eugene V. Debs. So, she became the first woman to ever to run for the United States’ Senate. O'Hare was eventually charged with interfering with the war effort by obstruction of recruitment and enlistment in the armed forces and sentenced to five years in the penitentiary. President Wilson commuted O’Hare’s sentence after she had served a little over a year (in May of 1920). President Coolidge granted O’Hare a full pardon in January, 1926. Then there is one of the most famous clemency cases ever. It led to a classic Supreme Court decision that is standard fare in constitutional law texts (didn't Toobin go to law school?). Vuco Perovich was the first person sentenced to death by hanging in the State of Alaska. He was scheduled to hang on August 14, 1907, but on June 5, 1909, President Taft commuted Perovich’s sentence “to imprisonment for life." He then received a pardon from Calvin Coolidge on July 25, 1927. Charles Bernstein's case was notable in the District of Columbia. Twice sentenced and originally scheduled for execution. he received reprieves from FDR on January 7, March 4, 1935 and March 25, 1935, and commutations on May 28, 1935, and June 12, 1940. He was finally pardoned by Harry S Truman on April 30, 1945. Bernstein later testified before the House Judiciary Committee and a Senate bill sought compensation for his false convictions. Congress chewed on the matter for seven years and NBC aired a program based on his story - which led to a notable law suit. Probably not enough fireworks for a meticulous scholar / expert like Toobin to even notice. We don't want to beat a dead horse. We know fame is fleeting. Really, we get it. But you have to work at being as clueless as Toobin is on this front. You gotta want it. Bad. Far from being simply a matter of calling out sloppy (but really interesting) writing and research, the topic is of considerable import at present. The President has made an issue of commutations and is likely continue to do so. 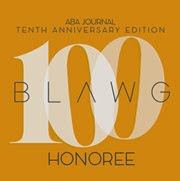 Those interested in reform of the criminal justice system note the collateral consequences of felony convictions make it quite hard for individuals to integrate back into society as law-abiding, productive citizens. They argue the President should also be granting pardons, to restore civil rights, and remove unnecessary hurdles. Of course, President Obama's term is about to come to an end. Are pardons - from presidents to follow - so freakishly rare that only the likes of Patricia Hearst has pulled one off? Yes, but only if you are unfortunate enough to read - and believe - the "legal expertise" of Jeffrey Toobin. UPDATE: Having been informed of the information in this post, Jeffrey Toobin has tweeted that he finds it "fascinating."